I read an article in the New York Times a few weeks ago about the shortage of mussels on the US Eastern seaboard this winter. It wasn’t the usual sad story of overfishing. Instead, the heavy ice caused by the brutal winter simply made them difficult to harvest. The fisherman just couldn’t get to them. Luckily, the thaw has brought them back to market shelves in their usual numbers. The article got me thinking about two things. First thing was, I am so glad those waters have thawed, along with the ice dams clogging up my gutters, the street plow-imposed glacier blocking my driveway, and all twenty of my fingers and toes. The second thing the article got me thinking about was how much I love mussels. To celebrate, I decided to make myself a bowl for lunch. While this may sound like it was extravagant and time consuming, I assure you it was not. 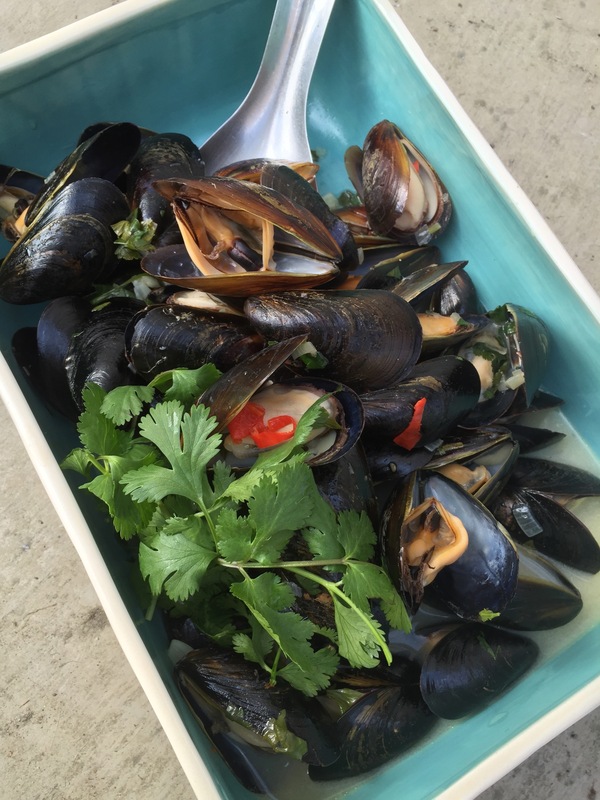 Belgian style mussels (or the Thai influenced version I have created here) are actually super easy to prepare. Now I know you’ve heard that before from many a food writer, but this time I really mean it. There’s hardly any chopping prep involved and the whole thing needs to cook for no more than 12 minutes, tops. And don’t forget, mussels are “the poor man’s oyster.” That is, they are very inexpensive to buy, usually around 3 to 4 dollars per pound. And they are plentiful. This is not a seafood that presents an ecological dilemma for you at the fish market. You can feel guilt-free purchasing this bivalve. For that kind of time and monetary investment, I think the return is pretty darn good. If this is not exactly midweek lunch fare for you, try it out on a Friday night for a romantic dinner in, or whip it up for a really fine looking appetizer when you’ve got friends coming round for dinner. In a large wok or deep saucepan, heat the oil over low heat. Add the shallot, garlic, chile, and lemongrass (if you are using). Cook, stirring, for about 5 minutes, until softened. Increase the heat to medium and add the beer and sugar. Bring just to the boil. Pour in the mussels, reduce the heat to medium-low, cover, and cook for about 5 minutes, until the mussels have opened. Using a slotted spoon, remove the mussels to a large bowl, discarding any that have not opened. Remove the lemongrass stalk. To the broth in the wok, add the coconut milk, lime juice, fish sauce, and cilantro. Cook, without boiling, for 2 minutes. Pour the mussels back into the broth and serve with rice, crusty bread, or glass noodles. *Lemongrass can be found in specialty markets. It will lend a slightly floral, citrus flavor to your broth. If you can’t find it, don’t sweat it. This broth will have plenty of flavor without it. This entry was posted in appetizer, lunch, main and tagged beer broth, broth, chile, coconut milk, mussels, seafood, thai. Bookmark the permalink.